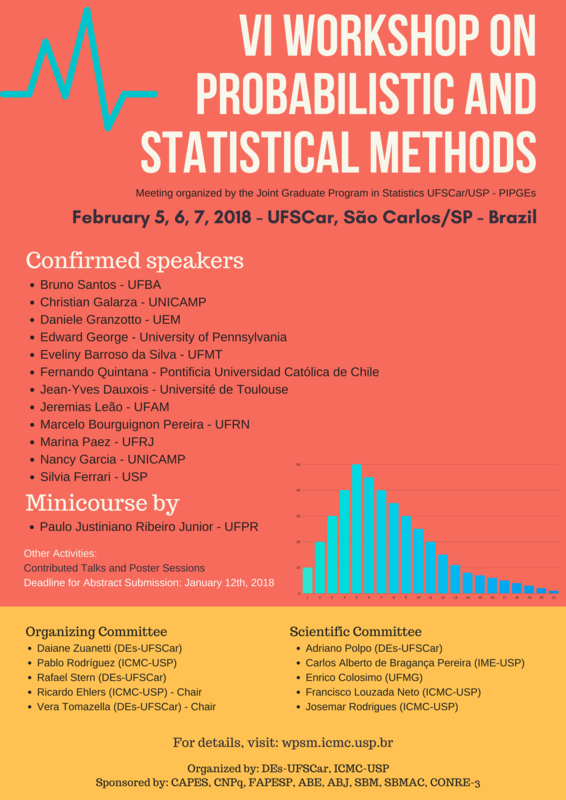 The Workshop on Probabilistic and Statistical Methods is a meeting organized by the Join Graduate Program in Statistics UFSCar/USP (PIPGEs) with the aim of discussing new developments in statistics, probability and their applications. Activities include invited speaker sessions, short talks, a poster session and a short course devoted to graduate students. The topics of this new edition include probability and stochastic processes, statistical inference, regression models, survival analysis and related topics. 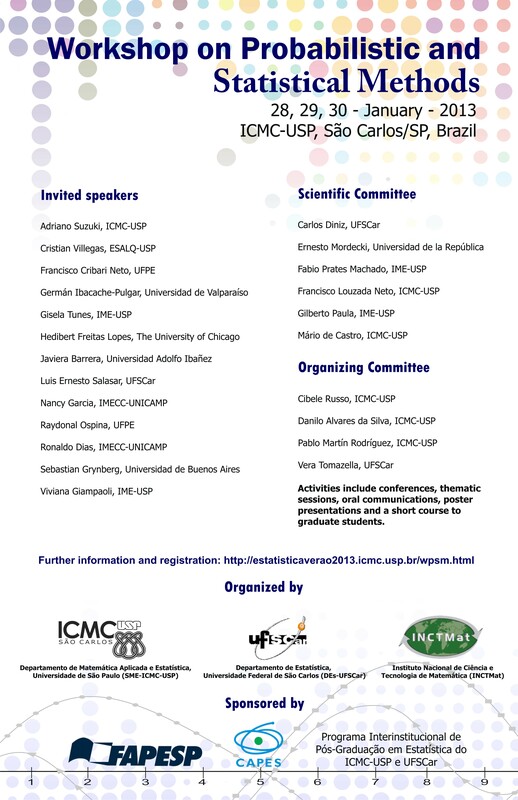 See below the titles and abstracts of the conferences and talks. In this talk, we will consider a one-dimensional probabilistic cellular automaton where their components assume two possible states, zero and one,and interact with their two nearest neighbors at each time step. Under the local interaction, if the component is in the same state as its two neighbors, it does not change its state. In the other cases, a component in state zero turns into a one with probability α and a component in state one turns into a zero with probability 1-β. For certain values of α and β, we show that the process will always converge weakly to δ the measure concentrated on the configuration where all the components are zeros. Moreover, the mean time of this convergence is finite, and we describe an upper bound in this case, which is a linear function of the initial distribution. We also exhibit some results obtains from mean-field approximation and Monte Carlo simulations, which show coexistence of three distinct behaviours for some values of parameters α and β. This work was developed joint with A. Leite. In the analysis of count data often the equidispersion assumption is not suitable,hence the Poisson regression model is inappropriate. As a generalization of the Poisson distribution the COM-Poisson distribution can deal with under-, equi- and overdispersed count data. It is a member of the exponential family of distributions and has the Poisson and geometric distributions as special cases, as well as the Bernoulli distribution as a limiting case. In spite of the nice properties of the COM-Poisson distribution, its location parameter does not correspond to the expectation, which complicates the interpretation of regression models specified using this distribution. In this paper, we propose a straightforward reparametrization of the COM-Poisson distribution based on an approximation to the expectation of this distribution. The main advantage of our new parametrization is the straightforward interpretation of the regression coeficients in terms of the expectation of the count response variable, as usual in the context of generalized linear models. Furthermore, the estimation and inference for the new COM-Poisson regression model can be done based on the likelihood paradigm. We carried out simulation studies to verify the finite sample properties of the maximum likelihood estimators. The results from our simulation study show that the maximum likelihood estimators are unbiased and consistente for both regression and dispersion parameters. We observed that the empirical correlation between the regression and dispersion parameter estimators is close to zero, which suggests that these parameters are orthogonal. We illustrate the application of the proposed model through the analysis of three data sets with over-, under- and equidispersed count data. The study of distribution properties through a consideration of dispersion, zero-inflated and heavy tail indices, together with the results of data analysis show the exibility over standard approaches. Therefore, we encourage the application of the new parametrization for the analysis of count data in the context of COM-Poisson regression models. The computational routines for fitting the original and new version of the COM-Poisson regression model and the analyzed data sets are available. The Atlas model is an interacting particle system where one starts with Poisson marks in [0,∞) which represent particles. As time runs, these particles perform independent Brownian motions, with the only exception being that, at any time, the leftmost particle has a drift to the right. Our main concern is to identify the possible behaviors of the leftmost particle (transience to the right, transience to the left, recurrence) as a function of the bias. Vivemos numa era em que a disponibilidade e acessibilidade a dados não tem precedentes. "Big data" é uma das tendencias deste início do Milênio a confrontar o pensamento estatístico. Por um lado, há imenso potencial para aproveitar as novas fontes de informação que se tem tornado disponíveis, acessíveis e de baixo custo. Por outro lado, lacunas substanciais persistem e há imensos riscos de utilização inadequada dessas fontes pelos que desprezam as lições traduzidas nos principais fundamentos do pensamento e da metodologia estatística. Uma das falácias principais é a de que, com as imensas bases de dados disponíveis, não será mais preciso avaliar incerteza de estimativas, pois será possível "conhecer" as quantidades de interesse a partir dos "big data". Apresenta-se o conceito de "índice de defeito dos dados" proposto por Meng (2018), e usa-se este conceito para mostrar que a qualidade de estimativas baseadas em pequenas amostras bem planejadas e executadas pode superar a de estimativas baseadas em conjuntos muito maiores provenientes de fontes orgânicas sujeitas a vieses de seleção. Penso que a metodologia estatística fornece a orientação essencial necessária para obter respostas atuais, relevantes, precisas e custo-efetivas às perguntas de interesse, mesmo na era do "big data". Apresentarei alguns exemplos ara motivar a discussão dessas ideias. We characterize tumor variability by hypothetical latent cell types that are defined by the presence of some subset of recorded SNV's. (single nucleotide variants, that is, point mutations). Assuming that each sample is composed of some sample-specific proportions of these cell types we can then fit the observed proportions of SNV's for each sample. In other words, by fitting the observed proportions of SNV's in each sample we impute latent underlying cell types, essentially by a deconvolution of the observed proportions as a weighted average of binary indicators that define cell types by the presence or absence of different SNV's. In the first approach we use the generic feature allocation model of the Indian buffet process (IBP) as a prior for the latent cell subpopulations. In a second version of the proposed approach we make use of pairs of SNV's that are jointly recorded on the same reads, thereby contributing valuable haplotype information. Inference now requires feature allocation models beyond the binary IBP. We introduce a categorical extension of the IBP. Finally, in a third approach we replace the IBP by a prior based on a stylized model of a phylogenetic tree of cell subpopulations. Approximate Bayesian Computation (ABC) is typically used when the likelihood is either unavailable or intractable but where data can be simulated under different parameter settings using a forward model. Despite the recent interest in ABC, high-dimensional data and costly simulations still remain a bottleneck. There is also no consensus as to how to best assess the performance of such methods. Here we show how a nonparametric conditional density estimation (CDE) framework can help address three key challenges in ABC, namely: (i) how to efficiently estimate the posterior distribution with limited simulations and different types of data, (ii) how to tune and compare the performance of ABC and related methods with CDE as a goal without knowing the true posterior, and (iii) how to efficiently choose among a very large set of summary statistics based on a CDE loss. We provide both theoretical and empirical evidence to justify the use of such procedures and describe settings where standard ABC may fail. In this paper we investigate the merits of replication, and provide methods that search for optimal designs (including replicates), in the context of noisy computer simulation experiments. We first show that replication offers the potential to be beneficial from both design and computational perspectives, in the context of Gaussian process surrogate modeling. We then develop a lookahead based sequential design scheme that can determine if a new run should be at an existing input location (i.e., replicate) or at a new one (explore). When paired with a newly developed heteroskedastic Gaussian process model, our dynamic design scheme facilitates learning of signal and noise relationships which can vary throughout the input space. We show that it does so efficiently, on both computational and statistical grounds. In addition to illustrative synthetic examples, we demonstrate performance on two challenging real-data simulation experiments, from inventory management and epidemiology. Redes Bayesianas, também conhecidas como redes causais, redes de crenças ou redes probabilísticas de dependência, surgiram na década de 1980 e têm aplicadas em uma ampla variedade de atividades do mundo real. Em suma, são uma representação gráfica (grafo acíclico e direcionado) das variáveis e suas relações para um problema específico, sendo tal estrutura um elemento fundamental da rede. Nesta apresentação serão expostos alguns métodos de clássicos de construção da estrutura das redes e estimação de parâmetros, bem como aplicações recentes nas áreas financeira, biológica e educacional. Accurate and robust forecasting methods for univariate time series are very important when the objective is to produce estimates for large numbers of time series. In this context, the Theta method's performance in the M3-Competition caught researchers? attention. The Theta method, as implemented in the monthly subset of the M3-Competition, decomposes the seasonally adjusted data into two "theta lines". The first theta line removes the curvature of the data in order to estimate the long-term trend component. The second theta line doubles the local curvatures of the series so as to approximate the short-term behaviour. We provide generalisations of the Theta method. The proposed Dynamic Optimised Theta Model is a state space model that selects the best short-term theta line optimally and revises the long-term theta line dynamically. The superior performance of this model is demonstrated through an empirical application. We relate special cases of this model to state space models for simple exponential smoothing with a drift. À medida que as redes sociais da internet continuam se tornando integradas na vida cotidiana, os registros extensivos que estes sistemas arquivam como parte da operação normal prometem mudar os caminhos de pesquisa em várias areas de conhecimento. Assim, este minicurso discutirá o potencial da utilização destas redes sociais para levantamento de dados. Também será apresentado a limitações e dificuldades neste tipo de estudo. E por fim será apresentado alguns exemplos por meio das utilizaçao e facebook e twitter. Ao longo da última década, com o desenvolvimento contínuo da tecnologia e metodologias analíticas, a geração de dados genômicos a partir de amostras biológicas teve seu custo reduzido em ordens de magnitude. Na década de 2000, o sequenciamento de um genoma completo custou aproximadamente 100 milhões de dólares. Atualmente, o custo é da ordem de 1.000 dólares, no mercado internacional. Como consequência deste processo, hoje é possível o sequenciamento de indivíduos em escalas maiores, chegando até o nível populacional. Assim, torna-se cada vez mais comum a realização de estudos para identificação de posições genômicas associadas com a ocorrência de fenótipos de interesse, como doenças complexas. O processo de análise de dados é composto por diversas etapas, que incluem filtros de diferentes tipos e modelos estatísticos para a avaliação efetiva de evidências de associação. Neste trabalho, apresentarei, da perspectiva analítica, as estratégias empregadas no Instituto Brasileiro de Neurociência e Neurotecnologia (BRAINN/FAPESP) nos estudos realizados com o intuito de identificar bases genèticas da epilepsia. A Proteogenômica inaugura uma nova fase de pesquisa multi-omics na Biologia Molecular, buscando integrar eficientemente grandes bancos de dados do genoma, transcriptoma e proteoma com informações clínicas. A promessa é identificar padrões específicos de pacientes e usar esse conhecimento na medicina personalizada e de precisão. 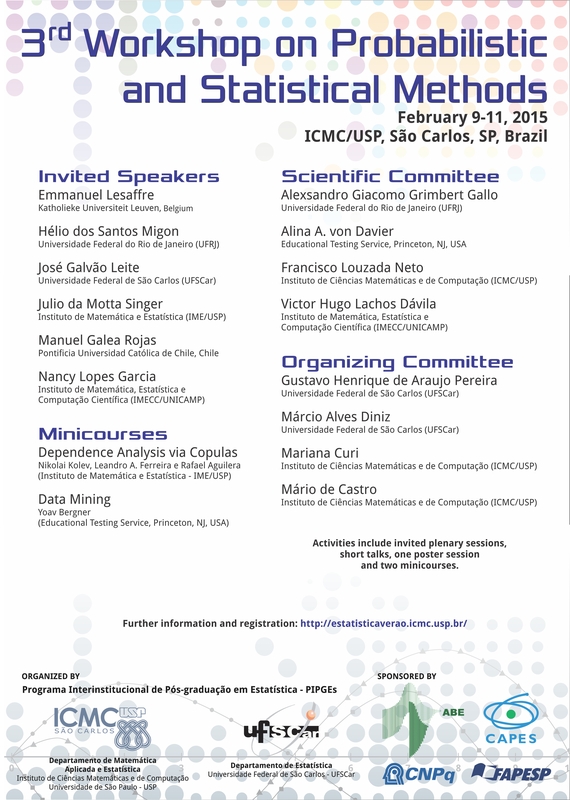 Esta palestra tratará dos desafios interdisciplinares envolvidos, da abordagem e contribuição da estatística para essa área de pesquisa. Current stochastic epidemic models ignore genetic heterogeneity in infectivity, which is the propensity of an infected individual to transmit diseases. Variation in this social interaction trait leads to the common superspreading phenomenon, where a minority of highly infected hosts transmit the majority of infections. To date, is not known whether infectivity is genetically controlled. We present a novel stochastic transmission model which, by combining individual-level Poisson processes with bivariate random effects, can fully capture genetic variation in infectivity. We show that not only can this Bayesian model accurately estimate heritable variation in both infectivity and the propensity to be infected, but it also can identify parents more likely to generate offspring that are disease superspreaders. We also present a Bayesian analysis of a large-scale fish infection experiment which, for the very first time, shows that genetics does indeed contribute to variation in infectivity and therefore affects the spread of diseases. We consider a stochastic process and a given n-string. We study the shortest possible return time (or shortest return path) of the string over all the realizations of process starting from this string. For a β- mixing process having complete grammar, and for each size n of the strings, we approximate the distribution of this short return (properly re-scaled) by a non-degenerated distribution. Under mild conditions on the β coefficients, we prove the existence of the limit of this distribution to a non- degenerated distribution. We also prove that ergodicity is not enough to guaranty this convergence. Finally, we present a connection between the shortest return and the Shannon entropy, showing that maximum of the re-scaled variables grow as the matching function of Wyner and Ziv. The frog model is a stochastic epidemic model on a graph in which dormant particles begin to move and to infect other particles once they become infected. We study the frog model with geometric lifetimes on homogeneous and on biregular trees. With the help of branching processes, we obtain bounds for the critical parameter of the model. We address a basic question when analyzing experimental data in Neurobiology with respect to the the identification of the directed graph describing "synaptic coupling" between neurons. We present a novel estimator of effective connectivity, applying it to simulated and real data from a high quality multielectrode array recording dataset (Pouzat et al. 2015) from the first olfactory relay of the locust, Schistocerca americana. Our starting point is the procedure introduced in Duarte et al, 2016 and we present two novelties from the mathematical point of view: we propose a procedure allowing to deal with the small sample sizes met in actual datasets and we address the sensitive case of partially observed networks. See the poster for the meeting below, and a full list of titles and abstracts of the talks, oral communications and posters. Click here to download the schedule of the workshop. Speakers: Júlia Maria Pavan Soler, Osvaldo Anacleto, Benilton de Sá Carvalho. Click here to download the schedule of the session. Speakers: Ludmila Rodrigues, Élcio Lebensztayn, Alejandra Rada. Click here to download the schedule of the oral communications. Click here to download a full list and schedule of the poster presentations. 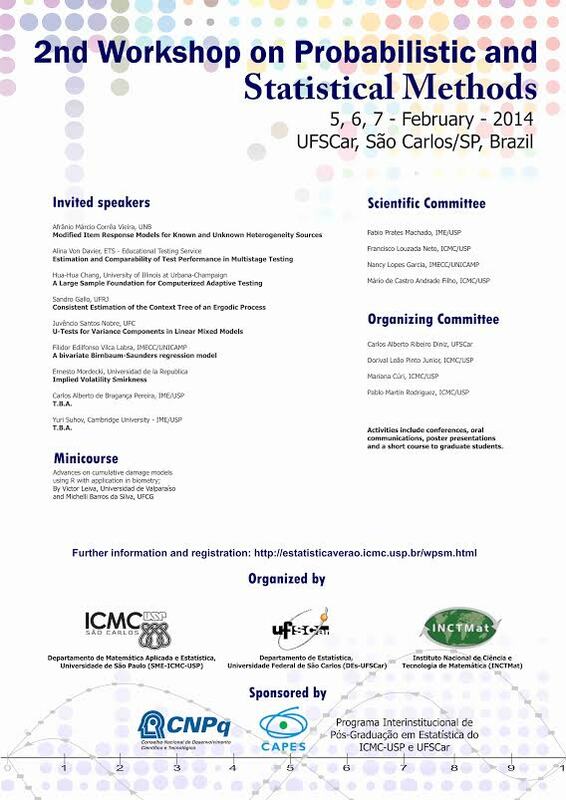 Click here to download the program of the meeting including titles and abstracts of all the presentations. List of registered participants. Last update of the list on February 1st, 2018. Remember that all attendees must pay the appropriate registration fee (see the Information section below for further details). For additional information, please contact us here. We will contact you back as soon as possible. 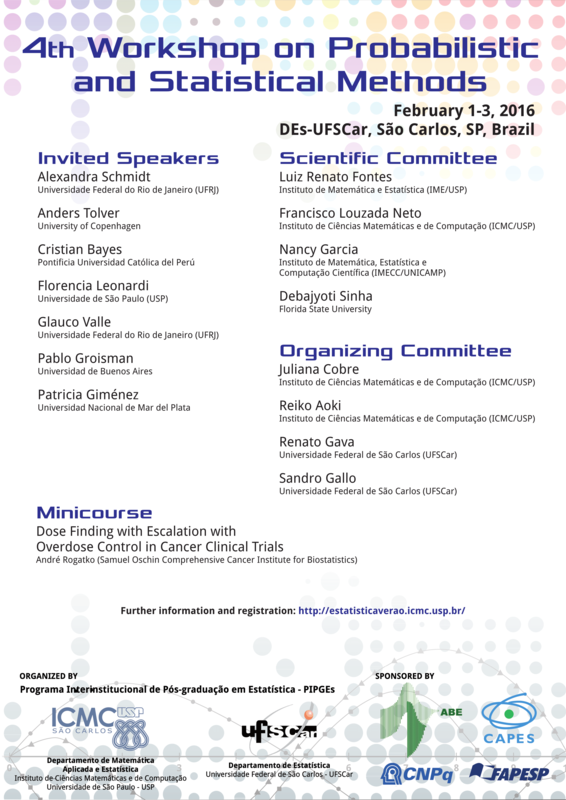 Registration and main activities will be held at the Auditório Fernão Stella de Rodrigues Germano. Bloco-6 Térreo, Sala 6-001. **Regular fees may be paid in cash at the registration desk on the first day. See below some information related to the previous editions of our meeting. 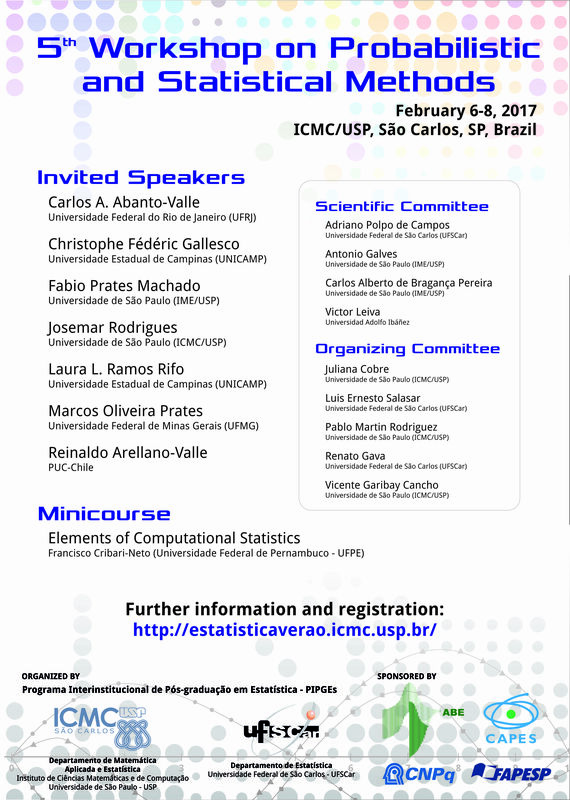 Since the first edition of the Workshop on Probabilistic and Statistical Methods, helded in 2013, we have received the contribution of many colleagues and students. If you have any question, please do not hesitate in contact us! We are looking forward to seeing you in São Carlos.